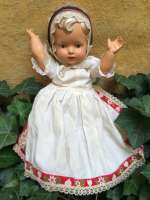 Lovely Danish Celluloid girl doll in original dress. Køge ca 1945. Lovely Danish Celluloid girl doll in original dress. ca 1945.Lovely face and and typical 40-ties hairstyle.Excellent condition. Size 35 cm/ 13 3/4"